The AP170 5GHz Directional Antenna is an outdoor single-band (5GHz) antenna with 18dBi gain. The antenna is well suited for applications where a narrow beam 17 degree H-plane is most optimal. The typical application where mounting location can be in an outdoor environment with a point-to point range expansion requirement. 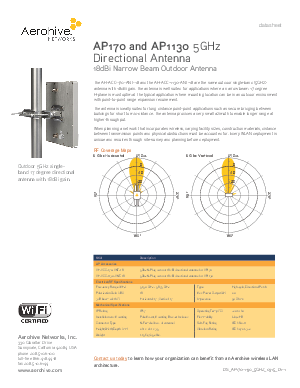 Download this datasheet to learn more about the Areohive outdoor 5GHz Directional Antenna.